In today’s era of digital connectivity, live audience polling has become standard practice for many election organizers. Still, many organizations and government agencies, particularly, question the security and performance of audience response systems with electronic voting and elections capabilities. Promises to save time and resources spent on manual vote counting are a given benefit of ARS. However, the voter registration, authentication, and security features of these platform providers may vary, for better or for worse. For election organizers representing government agencies and world renowned institutions there is no room for error in choosing a live audience polling system. 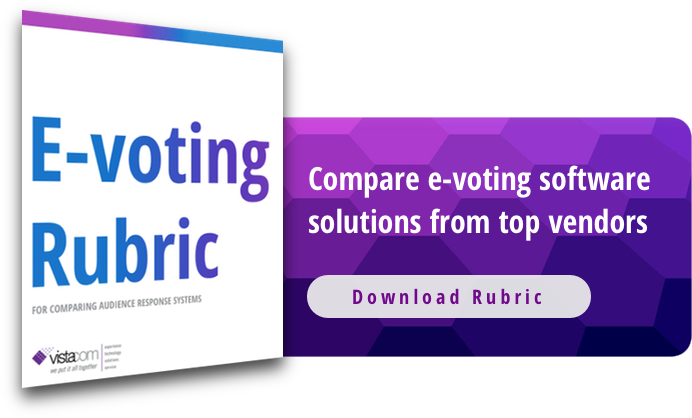 This free downloadable rubric outlines the most important features and factors to consider when selecting an audience response system for voting and election events.